Although originally conceived by Conan-creator Robert E. Howard as his own version of Lovecraft’s Necronomicon, the Nameless Cults-grimoire was subsequently used also by Lovecraft, and has thus entered the Mythos-canon. A big fan of Lovecraft, Karl Sanders of the Egypt-inspired death metal band Nile wrote a song simply called “Von Unaussprechlichen Kulten”, closing their 2005 album Annihilation of the Wicked. 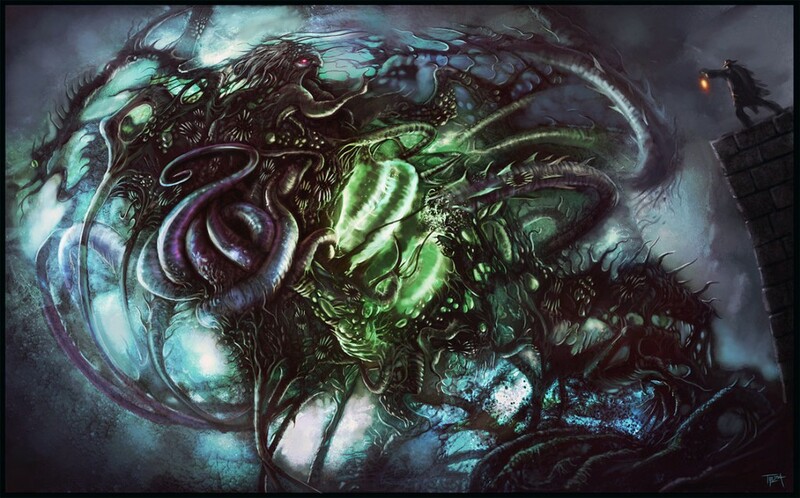 There is also a Chilean brutal death metal band called Unaussprechlichen Kulten, who have lyrical themes dealing extensively with Lovecraft and the Cthulhu Mythos. Additionally, the title of Nile’s debut Amongst the Catacombs of Nephren-Ka is taken directly from the story The Outsider, with the final track “Beneath Eternal Oceans of Sand” re-telling Lovecraft’s story of a lonely man trapped inside dark halls. Lines from the same story are used verbatim in Swedish doom metal group Draconian’s “It Grieves My Heart”, and the story forms the base of Electric Wizard’s “The Outsider”. The Outsider, by Elliott Rodriguez. Speaking of Electric Wizard, Dorset’s resident stoner doom titans have returned to Lovecraft’s New England several times throughout their careers. In addition to “The Outsider”, their seminal album Dopethrone features the song “Weird Tales”, which deals with Kadath and the distant planet Yuggoth. Closer to earth, their 2007 release Witchcult Today includes the haunting doom rock number “Dunwich”, which tells the tale of Lovecraft’s The Dunwich Horror. In the small (fictional) Massachusetts town of Dunwich, a woman bears a child that is not fully human, with a father that is alluded to being the terrible god Yog-Sothoth. When an unprecedented entity is unleashed upon the Arkham hills, it becomes the job of a group of Miskatonic professors to stop this hybrid monstrosity before the town (and possible the world) is destroyed. Electric Wizard add some pathos to the monster, and a twist of Rosemary’s Baby when frontman Jus Oborn chants “Child of Dunwich rise / You have your father’s eyes”. The Dunwich Horror by Tmza. Perhaps the most Lovecraftian group mentioned so far, the British heavy metal band Arkham Witch are not shy about their main lyrical influence. Although they have songs about Robert E. Howard’s fantasy stories, the bulk of their material is shameless Lovecraft-worship. From “The Lord of R’lyeh” on their debut On Crom’s Mountain (a Conan reference), to their 2013 album Legions of the Deep, and their newly released I Am Providence2 which contains 20 tracks, each centered on a different Lovecraft story. The band sprung from the ashes of doom metal group The Lamp of Thoth, who recorded “Shub-Niggurath” and “The Doom That Came To Sarnath”, the latter being based on the somewhat obscure Lovecraft story by the same name. A series of cover art used by Arkham Witch. L to r; Conan’s god Crom, Cthulhu and deep ones from The Shadow Over Innsmouth, and the witch Keziah Mason with her familiar Brown Jenkin, from Dreams In The Witch House. Shub-Niggurath is another creature invented by Lovecraft, referred to in his 1930 story The Whisperer In Darkness as “The black goat of the woods with a thousand young”, and worshipped by extraterrestrial cultists. “The Black Goat of The Woods”, often shortened to “The Black…”, is also a track on Swedish black metal band Marduk’s first album Dark Endless. The moniker Shub-Niggurath is also taken by a Mexican blackened death metal band, whose songs primarily deal with Lovecraftian horrors. Their latest album, 2011’s A Deadly Call From The Stars, includes telling titles such as “Ode to the Ancient Ones” and “The Summon of Shub Niggurath ye Black”. 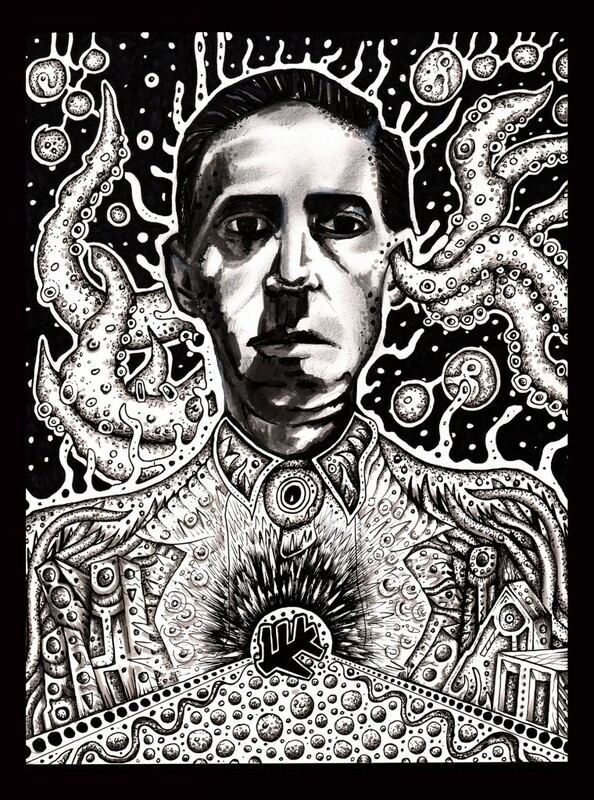 Portrait of Lovecraft by The Great Old Ones’ Jeff Grimal. On the subject of purely Lovecraft-themed metal groups, the French post-black metal band The Great Old Ones have been turning heads during the last few years. Their debut album Al-Azif deals with the Necronomicon, while their 2014 sophomore effort Tekeli-Li is a concept album based on the novella At The Mountains of Madness. This 1931 story, which was the longest Lovecraft ever wrote, tells of an Antarctic expedition from Miskatonic University, which goes terribly wrong as the protagonist unveils ancient secrets of an elder race. The climax of the story involves a shapeless horror known as a Shoggoth, which announces its rapidly shifting arrival by the sounds “Tekeli-li. Tekeli-li”. The slowly mounting tension of the novella seems to have captured the imaginations of traditional doom metal purveyors The Gates Of Slumber, whose track “Descent Into Madness” trails the same glacial waters as The Great Old Ones. 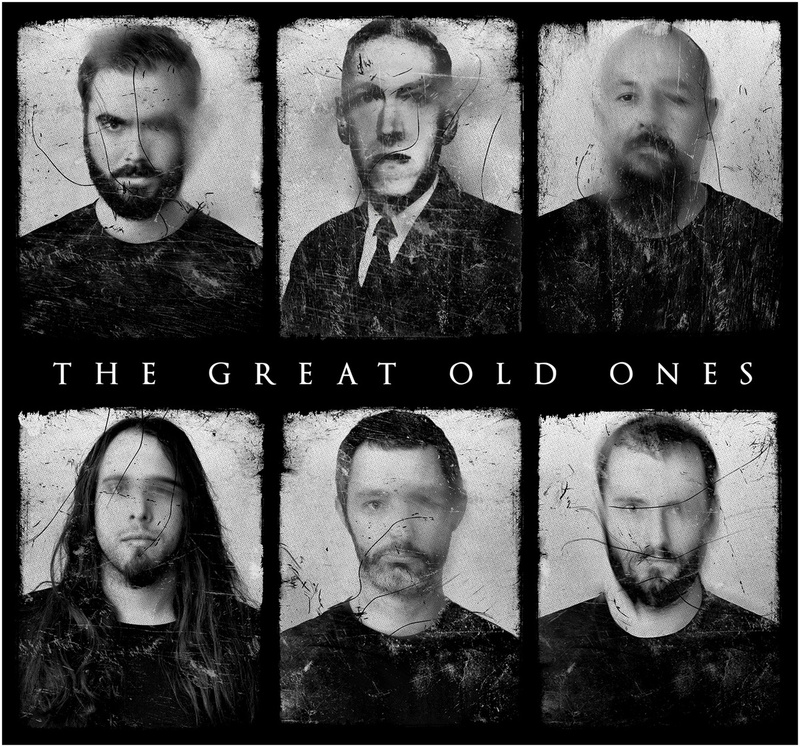 The Great Old Ones, featuring Lovecraft on demonic bagpipes. In the fifth and final part, we move on to a remaining handful of bands that owe great debts to HPL. 2 Translates to « Unspeakable Cults». Lovecraft’s intention, however, was a German translation of “Nameless Cults”. 3 «I Am Providence» is also written on H.P. Lovecraft’s headstone.